Yes, another Matchmaking-Related thread - this time with an aim at guiding FreeJam toward making better choices for the future. First the History of MatchMaking and Robocraft. In a bygone era there was once a matchmaking system that focused upon the CPU of bots queuing for a match. This was before my time however the feedback I get is that is was not ideal. It is unclear how balanced CPU values and part strengths were back then - but if the CPU-to-part-worth was anything like that which we know today then it would be safe to expect that such was not an ideal system - being conducive to meta-formation-and-crystallization. Furthermore this system of matchmaking did not directly take the skill level of a player into consideration - with all the 'seal-clubbing' potential that such gave rise to. At some point less distant in the past with the flattening of and doing away with tiers, the matchmaking system shifted towards player rating as the sole consideration for determining a fair match-up. The rating was visible to all in the League Arena mode. The primary issue here was that it paid no heed to the quality or nature of the bots being fielded - which presented a ripe opportunity for groups of "friends" to use the party feature in such a way that any matchup other than versus another group of "friends" of similar inclination would result in a stomp of the opposition. It became an open secret that the highest rank of League was reserved for those who partied-for-advantage - being able to field a full-lineup of bots best suited for the mode, making life easy for themselves at the cost of whomsoever they randomly stomped. Yes some things haven't changed since (other than the severe tesla nerf) - Its an illustration. 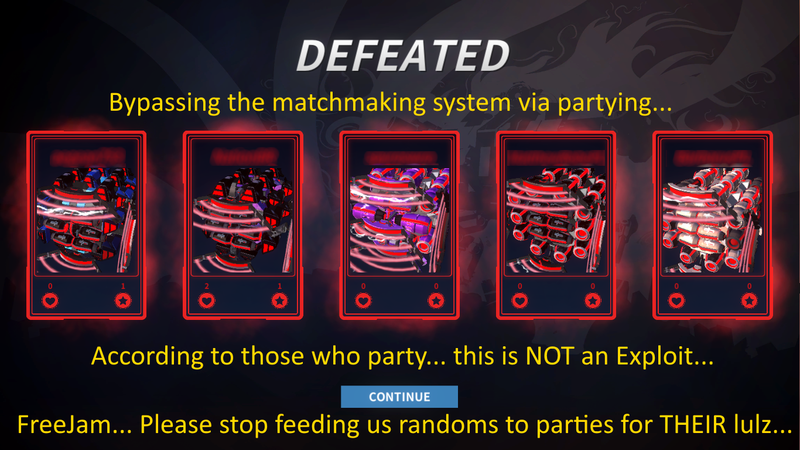 Well - lets just say that matchmaking by player skill alone wasn't good enough - and efforts to mitigate the licence-to-stomp that 'some' parties sought simply resulted in unacceptable waiting times in an effort to orchestrate a party-vs-party which might not have been fair anyway since not all parties are formed 'for advantage' anyway. Before we move on from here... there was one more thing that was very wrong with MMR. It had very little to do with Individual performance. One could carry the hell out of one's team or be the cowardly sloucher and everybody would get rewarded or penalized EQUALLY nonetheless. That was the final nail in the coffin of MMR - and was why it was near enough impossible to achieve Protonium rank without partying (so much so that the protonium badge pretty much means "I partied to get this far"). We presently know a matchmaking system where the tiers of robots are the main consideration of the matchmaking system in its efforts to produce fair matches. This system may fairly be called a work-in-progress and yet some issues have already arisen. First of all - the focus upon robot tiers as sole factor for matchmaking has (as some have predicted) divided the player base - with the result that AI players are frequently enough inserted into matches. Which wouldn't have been 'so' bad if the matchmaking system prevented uneven AI representatives between teams - effectively setting up a handicap match (More obvious in TDM where one AI bot thinks its a good idea to walk into a team of 5 enemy players). Sadly the lines between AI and REAL players have also been blurred as there is nothing to let the team know that they have any AI players on their team or which ones they may have to babysit and prevent from throwing the match. All the more frustrating when the AI bots are pathetically weak and non-tanky bots. At the LEAST they should have the same player banner not accessible to other players. Again player skill is not taken into consideration (the cannot-be-lost ranks within the tiers is a very poor substitute) - which again sets up an opportunity for those "friends" who play for advantage - except that the quality of player is now equally a factor as compared to the advantage of setting up a pre-match meta-enough line-up. Such if fun for nobody except maybe those who are doing the steam-rolling. The previous screenshot of teslas may not be true for a while thanks to the nerf - but the lineup will simply shift to whatever meta emerges. Is it not time to get matchmaking right? You always focused on one part of the puzzle. Would it be hard to convince you to learn from everything that you have already tried and come up with a much better matchmaking system? One that would work a LOT better 'provided' that you finally, truly balance the parts to a polished level? Between measuring the total investment of CPU into a bot and measuring the roboranking of the sum of the parts in a bot - one should get a fairly accurate idea of 'how much went into' any given bot. While one could seek to ignore one or the other - considering both is optimal. Once and for all come up with a FAIR scoring system in-game that reflects the true contribution of a player to a given match. Since this is such a big issue and potential obstacle to implementing a Player Rating properly - lets get into it. Player Rating = an Arbitrary number gained and lost based on performance over various matches. ...This is a step towards what should have been from the beginning - and keeping in mind that 'rating' includes the fixed Bot Rating - Obviously there are room for tweaks. This also works better in the context of a game where parts and scoring are more refined and consistent. Does this prove anything more than that certain players lack both the spine and the integrity to do anything more than throw mud and hide their hands behind their backs? Its about time that FreeJam recognizes that this is precisely the low-caliber of player that they pander to when they persist in failing to tweak the matchmaking system such that those who party-for-advantage-without-regard-to-the-right-of-EVERYBODY-else-to-enjoy-an-adequately-fair-match benefit at the expense of EVERYBODY else. If I were the owner of Fj, I dismiss some of my current staff and contract some of this forum. I'll settle for a better game, and a modest degree of two-way communication. The previous elo algorithm has critical logic mistake. Nearly crash to settle the opposite side of master-end 5-partying. I had already suggested one. This system either let them wait long enough until another 5 masters are gathered(partying or solo), or have an ability to gather the max veterans in that current player's pool. It also do not force partying versus partying. It has no meaning of some chats-gathered 5-parties colliding a high-end clan parties. But better challenge for 5 random solo masters to give a force against them by matchmaking system. Last edited by tziii0001; 12-21-2018 at 12:44 PM. Of course. In the event that, even after every effort is made to ensure that partying confers no significant advantage except those attributable to in-match teamwork, the matchmaking system is 'still' found to be lacking - then measures specifically targeted at mitigating such may be explored - the less invasive the better. First the matchmaking system itself needs to be addressed. Last edited by adinet; 12-21-2018 at 07:34 PM. My comment was just a joke (maybe not happy) to highlight my impression that I see more hard work for the good of the game in some people in the forum than what I see in the FJ releases. I can not believe that FJ can not find a good MM algorithm or a mixed system like "Algorithm is not perfect" + compensatory measures = nice match. "compensatory measures" = If the MM achieved in an acceptable waiting time maintains some type of injustice, it is ok, take it and add some type of correction in the damage, the healing, the mobility (you choose) of the selected teams. This is an invasive way, yes I know, but, if I get a nice MM by its means, I have no problem with it. You yourself made an elaborate proposal, alive0001 and other people too. I am far from being able to judge them but it seems to me that they point towards the good path that most of us desire. So, I'd really like it if FJ finds them wrong, impossible, anti-business, or whatever, that at least they say something. Last edited by adinet; 12-21-2018 at 07:30 PM. A lot of people have provided good feedback and suggestions over the years. Some of it had more effort put into it than others. The boost compensatory measure that teams get when somebody disconnects is one way to try and make a match even where no perfect match can be established. Simply repurpose such to introduce a boost equivalent to the degree to which the lesser rated party is disadvantaged - whether it be 2% or 22% (Lower percentiles likely and such percentiles would be silent). One could also rubberband any such boost to diminish based on game advantage. Yes. Feedback would be nice... as would an open discussion about things before plodding in with decisions. Thanks again for your feedback! As an aside... Let us pause to consider why it is important to improve matchmaking in general. Let us do so by looking at the imbalance-amplifier... parties and their impact on games. Look at the line-ups and ask yourself the odds of matchmaking bringing a set of such bots together in the event of selecting from randoms. The game is stacked in favour of those who party precisely because there are imbalances to exploit - and partying in Robocraft is pretty much the equivalent of 'stacking the deck in one's fsvour' - being able to field a set of way above average bots pretty much dooms any honest opposing team of randoms from before the start. Some may do so without thinking about it - but others know precisely what they are doing: Effectively activating easy mode in Robocraft. And that is not good for anybody - other than a select few who thrive upon such shallow victories at the expense of the enjoyment and fair treatment of other players. Last edited by Avestron; 12-26-2018 at 01:24 PM.